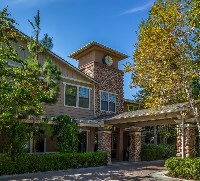 Goldware Senior Housing is a 162-unit market-rate and affordable apartment community for people 55 and over located in the city of Riverside, CA. The property has a 1½ - 2 year wait list and is currently accepting applications. This property accepts Housing Choice (Section 8) and VASH vouchers. The building is a garden style, two-story craftsman design and features a renovated community room with beautifully landscaped grounds. Resident amenities include a pool, spa, tennis courts, clubhouse, computer lab, conference room, central laundry facility, barbecues, putting green, community garden and picnic areas. Storage units and carport parking are also offered. All one and two bedroom apartments include central heating and air conditioning and fully equipped kitchens. Second story apartments are accessible through private enclosed stairways, which can be equipped with electric chair lifts if necessary. Goldware Senior Housing provides many daily and monthly resident activities including bingo, potlucks, birthday parties, movies, arthritic swimming classes, tennis, field trips and more. The neighboring Janet Goeske Center offers local senior meals, transportation, and a variety of other services.